October 12, 2018 Hard times south of the Fraser River…Surrey is the second largest city in the province, with a large homeless population and even bigger population of people in core-housing need…living in housing they cannot afford, for which they are sacrificing other basic needs in order to remain housed. Tear down the homes, rebuild at over twice the price…Developers plan to tear down the aging rental stocks and replace them with condos and purpose-built rentals. The current population of renters who live in this aging infrastructure would be unable to afford the 200-300% increase in rent which would be demanded by the new landlords. 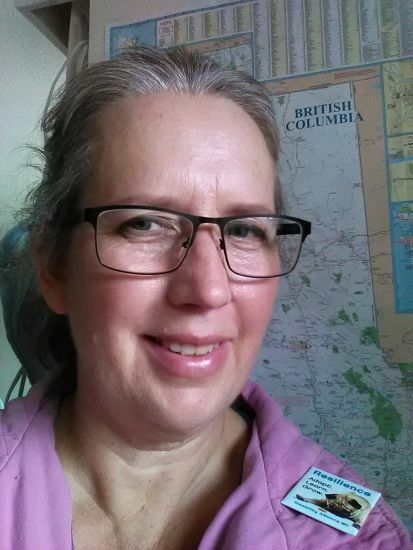 Renter to homeless person in three months…In the 0% vacancy rate of the lower mainland of BC, this would create a massive population of homeless renters, similar to what happened in Metrotown in Burnaby, commonly referred to as demovictions. Under the current Residential Tenancy Act the landlord only has to give the tenant 3 months notice to vacate. Housing = Human Right…The City needs to take any means necessary to protect the lives of renters for whom housing means life, and safety. The UN Special Rapporteur on Housing Leila Farha has stated "Housing is the cornerstone to life and human well-being...Housing makes or breaks us. It is the difference between life and death...housing is a fundamental human right." Stable, safe, accessible housing which costs less than a third of the renter’s income is what is required for people to survive. People who have been traumatized by homelessness and whatever led them to homelessness may need much more support to maintain their housing and lives, which we must provide. Work with staff, housing providers, non-governmental organizations, landlords, and other levels of government to provide assistance and incentives to maintain existing rental stocks, increase stock of social housing working with funders and providers, increase stock of temporary and permanent modular housing currently being funded by the province since it is the quickest form of housing to provide for street homeless folks, fight landlord discrimination against government-funded income recipients and other barriers to housing like no pets policies, and ensure all low-income renters are provided with rental supplements and other assistance to maintain tenancies. Establish a City Rent Bank for emergency funding of housing for low-income residents. Create a City Housing and Homelessness Outreach Team to assist people to find permanent or temporary housing, stay in the housing, and thrive in their lives in Surrey. Team members will help people meet their basic needs for survival – food, clothing, transportation, health care, employment, education, daycare and household necessities either by direct provision of aid if necessary, and by referral to appropriate community agency or service. This team will meet regularly with all city departments to assess changing conditions and needs – do ongoing needs analyses and ongoing short and long term action plans. The daily outcome for our city housing and homelessness team is this: EVERYONE SAFELY HOUSED, FED, CLOTHED, AND CARED FOR EVERY DAY. Emergency housing in municipal buildings: buildings which have the necessary amenities, and which are not currently being used, should be turned to the use of the people as need dictates. Instead of leaving people to survive or die outside in the cold, rain, snow, or heat on the streets of our city we should open buildings for use by the public. There are numerous city-owned buildings which have heat, light, running water, washrooms, showers, kitchens, rooms for sleeping, rooms for service provision, and so on. The city could provide outreach at these locations to connect people with necessary services to meet their needs. Companion animals should be welcomed and their needs provided for. Couples, friends, and families should be able to remain together. Those who are unable to cope with group situations must also be accommodated. Wifi and outreach services from the library can help people re-establish their lives while in temporary digs. Homeless people should also be given free access to recreation centers to wash, use the toilet, and enjoy the same amenities as the rest of the population. We must protect EXISTING rental stocks AT ALL COSTS. We are not going to build our way out of the housing crisis. The purpose built rentals and so-called “affordable housing” projects currently all the rage are only affordable to middle to upper income people. In many neighbourhoods the plan is to destroy existing aging rental stocks to replace them with these purpose built rentals, condos and “affordable housing”. The monthly rental cost will increase for the units by between 200-300%. So despite the new provincial legislation which requires developers to offer existing tenants first refusal on a unit in the new building, it will be impossible for most of the renters to come up with the new rental rates. The vacancy rate in the lower mainland is 0%. 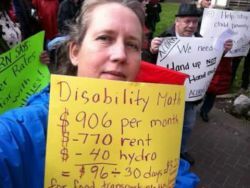 The housing allowance for the over 110,000 persons on provincial disability pension in BC and the thousands on social assistance in Surrey has remained frozen at $375 for a single person per month for housing. For these reasons any attempt to destroy existing rental stock will render most of the residents homeless. 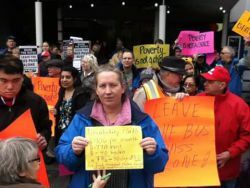 The city must incentivize landlords to maintain their existing rental stocks and de-incentivize any redevelopments until such time as the vacancy rate increases to a point where people can find safe affordable housing, and the provincial government increases disability and assistance rates to reflect reality. Renter advocates suggest a minimum 3% vacancy rate. New legislation allowing municipalities more leeway in creating rental-only zoning should be used to encourage developers to build what is most needed in our communities first. The focus should be on provision of social housing for those at the lowest income levels who are struggling just to stay housed in an increasingly hostile housing market which allows the wealthy to acquire residential properties and let them lie vacant as investments. Meanwhile local residents freeze and die on the streets for want of basic housing, which is their human right. Innovative housing initiatives for those struggling at the low-income end of society are essential to the survival of this demographic. We need to be open to Tiny Homes, modular housing, laneway housing, secondary suites, projects such as Dignity Village, and community collective solutions in whatever form they must take to keep people as safe as possible. Bring in legislation to control the vacancy rate, deincentivize demovictions and redevelopment of existing rental stocks. Introduce rental-only zoning to increase rental construction, with requirements for significant social housing units. Knowing what’s what…Keep a regularly updated register of demolitions, demovictions, AirBnB units, secondary suites, empty homes, rental stocks, and shelter beds, and take action to rebalance the housing equation. Track numbers of homeless people, people in core housing need, people in short-term rentals, people in unstable, unsafe housing, people in core-housing need in our communities, and take immediate action to protect lives. Regularly assess programs and outcomes. Make short and long term action plans to deal with deficiencies.